We think “Shop Small” should be a concept carried throughout the year and not just in November for Small Business Saturday. 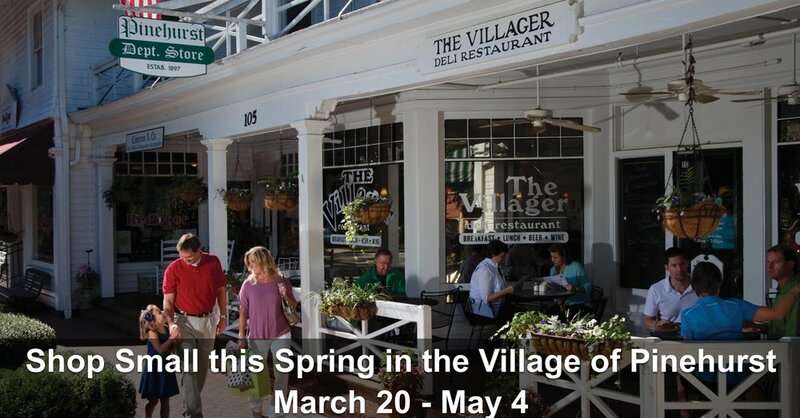 So, the Village is introducing “Shop Small this Spring” - a promotion to encourage residents to shop small year-round. Our hope is that as you prepare for Easter, Mother’s Day, bridal and baby showers, weddings and graduations, you'll keep Village businesses in mind and shop small this spring! As an added incentive, those who make purchases in Village of Pinehurst shops from March 20 - May 4 will be eligible to win a weekly prize as well as a grand prize gift basket filled with items from Village of Pinehurst businesses. Simply bring your proof of purchase(s) to the Welcome Center during that time period on Wednesdays - Saturdays from 10:00am - 4:00pm to be entered into a drawing for: (1) a weekly prize and (2) the grand prize gift basket drawing. For every receipt that you have representing a purchase from a Pinehurst business, you will receive one entry into both drawings. Please note the drawings are open to those ages 21 and over. The Welcome Center is located at 90 Cherokee Road in the Theatre Building (directly across from the Roast Office and Given Book Store). Keep an eye here for the growing list of businesses who are generously donating to the gift basket! Shop small and have a chance to win! To date, donations exceed $4,100!